Again while we were at the Musee du Louvre in the 1st Arrondissement of Paris, we took these high definition photos showing a statue called Bacchante that was sculpted by Jean Auguste Barre. This first HD photo shows a statue called Bacchante, and in Roman mythology Bacchantes were female followers of the God Bacchus, yet in Greek mythology they were known as Maenads who followed Dionysus, the God of wine and wine harvesting, but they were also referred to as drunken female revellers or even priestesses. 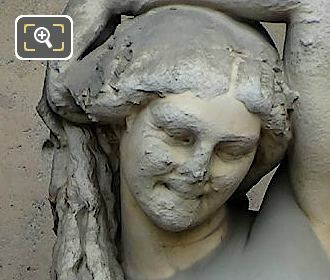 Yet this next image shows a close up of the Bacchante statue that was produced by Jean Auguste Barre who was the son of a medalist born in Paris in 1811 and initially followed in his fathers footsteps, but then also turned to sculpture, perfecting this form of art by training with Jean Pierre Cortot. Even though Jean Auguste Barre did not enter the Prix de Rome competition, he became well recognised, especially during the Second Empire where he became the favourite portrait sculptor for the Imperial Court under Napoleon III. And as well as this statue of Bacchante for the Louvre Museum, another statue of his can be found on the Fontaine Saint Michel, yet many of his works such as busts and portrait statues can now be found at the popular tourist attraction of the Chateau de Versailles. 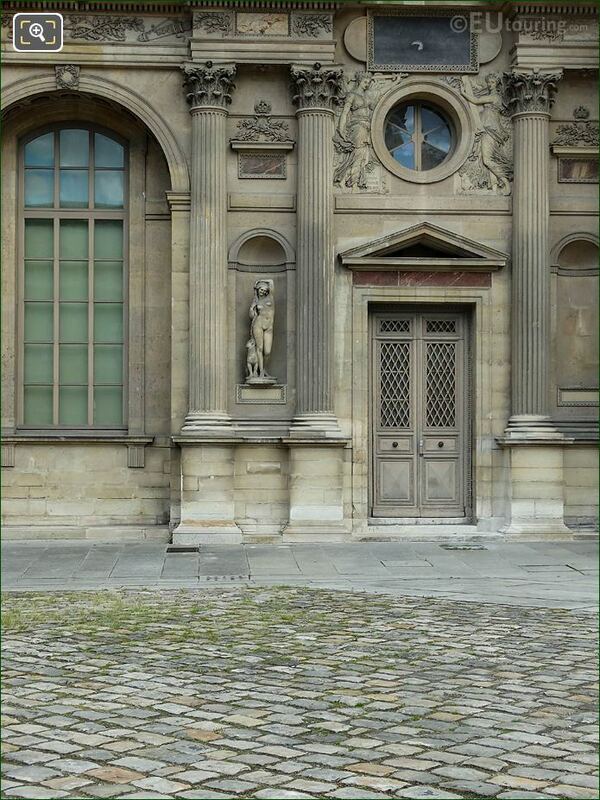 However, this photograph shows the location of the Bacchante statue within a niche on the first level of the Aile Est, and when you are looking at this facade of The Louvre from the courtyard called the Cour Carree, you will see this is positioned fifth from the left hand side.